I love to tell the story behind that summer in Switzerland in 1817, when the greatest literary giants met with their girlfriends and a drug dealer to play a loaded game. Who could write the best and scariest horror story? Instead of Lord Byron or Percy Shelly, it is the drug dealer who invents a figure that will become Dracula. It is Mary Shelly who invents the creature that is Frankenstein. These are the winners. Underdogs and torches. Margins becoming centers. If you fancy yourself a loser who ought to be a winner, you should feel energized by these stories of unlikely fame. The same could be said of you. My favorite analog for this can be found in background characters in popular culture who become more interesting, more powerful, or just plain cooler than their protagonistic superiors. These characters grow to be bigger even than the stories in which they appear. Here is a brief list of some of my favorite show-stealing minor characters. 1. Eric Von Zipper. All of the “kids” in those Annette Funicello and Franky Avalon beach movies were supposed to be winning types. 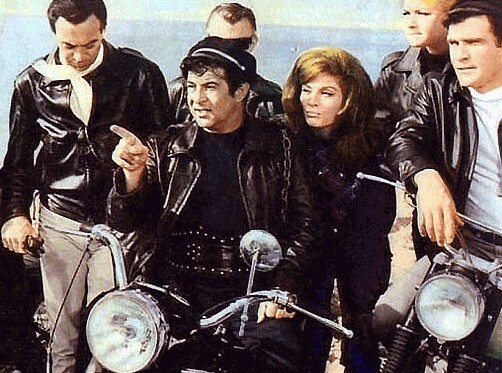 All except for the villains—that motor cycle gang, or, better yet, those send-ups of a gang, the most satirically absurd of which was their stuttering, portly leader. Think Buddy Hackett on a Harley and you get the picture. For some reason, the tiny child I was watching these movies in UHF weekend afternoons adored the utter stupidity of this guy. The reason escaped me then but I think I’m onto it now. At five I was myself a ridiculous imitator of cool, that kind of cool that wears a scowl and a leather jacket and which is usually brought to you by Brando or Dean. I was a grotesque of those grown ups and so I delighted in the deliberate travesty of Eric Von Zipper. And I wasn’t alone, as it turns out. Without him, there would be no Fonzy, no Squiggy, no Bowser. Just think of the emptiness! No. Don’t. Sometimes the abyss looks back. 2. Leather Tuscadero. Look into it. Happy Days. A pre-Joan Jett “chick” rocker. The coolest thing about Leather is that she happens to be a real musician, still rocking today. Like Mork –before his own show—this character was bigger than the show and so much more interesting than Fonzy, who by this time had become more of an Arthur. In the unplanned twentieth season, I’m nearly positive Fonzy would take over as head pizza maker at Al’s Diner. 3. Snaggle Puss. Forget Bugs and Mickey. And dare I say it: put aside Daffy for a moment. If you’re a writer, if you’re cultured, if you cringe when people say things like “supposably,” then this pink mountain lion is your cartoon totem. He’s a verbalizer. A trickster with words. A linguistic leader EVEN. On more than one occasion, this epigone of logos can be heard quoting Shakespeare, The Sweet Swan of Avon, the Bard EVEN. So if you’re not a fan of this minor character, this Hephaestus of the cartoon pantheon waiting to grow large, then you should be. If we all started liking him, he’d finally get his due in the face of all those other overly iconicized animals. He’d get his just desserts. He’d get payback. He’d get even EVEN. 4. Billy Jack. He’s not politically correct. He’s one of those “Indian” characters played by someone like Charlton Heston or Elvis (who may have more of a right) or that Italian guy always crying on his horse about litter along TV highways in the 1970s. But hey, didn’t they remake Walking Tall? Wasn’t that character, in the original, an angry white man from the south who decides to take his frustrations out with a huge stick? Recasting old stories with people like the Rock doesn’t erase those old stories (History is a palimpsest.) If states were people, Walking Tall is the tall tale that South Carolina tells its grandchildren at night with a full mason jar of clear liquid swooshing by its side as it creeks to and fro on an old rocking chair, creeking the floorboards of a decrepit porch. Instead of that hootenanny. Try Billy Jack’s pop 70s Powwow. Same story, more Indian (and hippie, and karate, and what’s MOST politically incorrect—overt references to the psychological toll of the Vietnam war). 5. the devil from Fantasy Island. Growing up, I have to admit, I was sort of terrified of Fantasy Island. I had foggy ideas of the place. Wasn’t it a cameo space of villainy in a James Bond film? And having the contrast in prime time of following the saccharine ineptitudes of the Love Boat only seemed to deepen the strange gloom that hung about the palm fronds that framed the aspect ratio of this show for me. Okay, maybe that eerie atmosphere was also helped by returning D-list celebs like freakishly small Paul Williams, the unacknowledged Peter Lorre of his day. Still, no returning character was more scary or as awesome as that of “the ol’ gentleman” himself (what characters in Thomas Hardy’s Wessex call the devil). Another vague notion that made this figure all the more creepy to me was the assumed relation of Roddy McDowall to Kubrick’s Alex from a Clockwork Orange (no relation). Every time the devil showed up, it was hard to heed Mr. Roark’s call for “Smiles, everyone, smiles.” In the background, I kept hearing muffled crooning from Singing in the Rain, punctuated every so often by a thwacking violence. 6. Hawk from Buck Rogers. Oh yeah. This is the nitty gritty of scene stealing. I was not the only second grader who complained that all the lunch boxes of Buck Rogers were stupidly filled with faces of that pearly smiling, smarmy Boy Scout leader and his stupid little R2 knock off—no disrespect to Boy Scouts or the unparalleled, indisputable genius of Mel Blanc. What we all wanted was Hawk on a lunch box. Maybe with his own cool-looking space jet, and his similarly feather-headed girlfriend, and maybe a few stray vignettes of Tiger Man biting Buck’s foot off or something. And Wilma’s nice too. But god, less Buck! Thanks to postmodernism—more the kind theorized by Jameson than Hutcheon—we’re sure to get all of these once “original” characters reprised. The history is the future. So there’s still time to change the aching desert of good taste on lunch boxes of my second grade experience. Please, pop cultural deities, please let the Buck Rogers movie that they’re probably cooking up in a back lot in Pasadena as you read this, please let him be played by Will Ferrell. And please make Twiki more like the robot in Lost in Space, articulate, roving, bumpy, and electro-dangerous. 7. Dr. Bombay from Bewitched. I loved this show and all of its minor characters. Dr. Bombay was the best. As with the superbly acted performances by Montgomery as her character’s lookalike cousin Serena, Dr. Bombay was something even greater than a scene stealer, he was a show unifier. When an outstanding performance by a side character doesn’t outdo the acting of the leads or isn’t viewed by the audience as being so much better than the inferior whole, it lends not only a quality of greatness, but it also pulls the entire production together. It creates a sense of unity. When Bombay would come in, the show would give us glimpses of a larger world these witches come from, with authentically comparable characters and personalities, thrones and principalities. 8. Maya the alien from Space 1999. Yes I had a crush on her. She was Emma Peel with alienating bumps on her sideburns. She was Cat Woman and gorilla woman, and huge albino Halloween monster woman, by turns. She was the precursor of Seven of Nine, Lieutenant Ilia in the first Star Trek movie, and the singer from Fifth Element. When will movie makers figure out what sci-fi audiences like most and give them just that? All Spock and Maya. Nothing but Boba Fet. Let your Lukes and Leia’s lie. 9. that monkey boy with Rolling Stones pants from that one dumb kid show. I eventually websearched my way to enlightenment on this but I thought I’d leave my original header exactly the way I remember it. And Google is not so smart if you punch in that entire header either. Because it’s not Blink 182 or Jon Stewart or the Beach Boys. It’s Chongo from Danger Island, a character from the live-action show within the costumed-action show The Banana Splits. Other than the theme song for the outer show, so catchy it’s the perfect host for a punked out cover song, Chongo and his oddly appropriate primate chirping as well as his Mick Jagger legwear are the only memories I have of this one. 10. Thomas Hardy’s The Reddleman from Return of the Native. This is for you literary types in the orchestra seats. I read these sections of the novel and realized two things simultaneously: 1) that I would be a Victorianist and 2) that the Victorians had an imagination that was amenable to a superheroic aesthetic. In the Reddleman, very ruddy seeds are sewn, from which obscenely scarlet flowers of imagination bloom. In them, I can see Heathcliff with adamantium retractable claws and a berserker rage issue. In them I begin to smell Jane Eyre as a metamorph, Maya-like in her powers to take on the appearance of Bertha during those problematic lunar ramblings in the attic. Lost in them like a lotus-eater I begin to dream about Pip’s invisibility and Becky Sharp’s mind control. But then I wake up and realize that I was dead wrong on both counts. I would not go on to be a Victorianist and that imagination I thought to be universal was only the flip side of Hardy’s healthy appetite for the grotesque. After all, what good would a superhero be whose only power is an indefatigable ability to produce the color red? Imparting redness to whatever he touches? Hmmm. I think a character like that, who could manipulate color, could very well oppose Chris Claremount’s Uncanny X-Men. A character like that could begin in the margins of villainy and grow to such heights of popularity as to warrant adding her to the group for a while. I’m referring to Dazzler, of course, an erstwhile mutant celebrity of light on disco roller skates, whose iconicity is brought to you, perhaps, by Thomas Hardy and a gloriously failed Victorian notion of the superheroic. Gotta LOVE the big guy on his scoot! Hilarious post. THANK YOU!